One of many unrelated Broncos. One of the very talented smaller lightweight wrestlers who made UWA undercards very entertaining. Often teamed with Rocky Santana and Romano Garcia as Los Diabolicos which actually led to an interesting feud many years later in AAA when Garcia (then known as Mr. Condor) and his new Diabolicos trio were attacked by a group of men at a show in Nezahualcoyotl. Those men turned out to be Bronco, Rocky Santana & El Gallego. This ignited a bloody Diabolicos AAA vs Diabolicos UWA feud that last a few months and is still memorable to many Lucha Libre fans. Seemed to disapear after that feud although rumors say he may have been under a mask as part of the Cholos AAA stable or even one of Los Insectos. 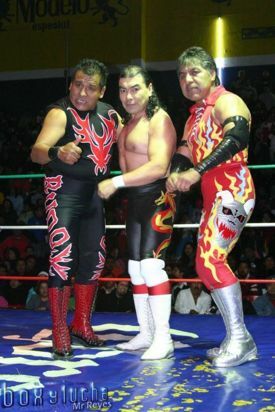 Eventually returned to the ring under his Bronco identity for a series of UWA Reunion shows that were run in 2008 at Arena Lopez Mateos where he formed a trio with his old buddies Romano Garcia & Rocky Santana. This page was last edited on 5 June 2013, at 08:48.